This extensive 11-day luxury flying safari highlights Namibia's 'must-see' destinations, with superb stays in high end camps and lodges. 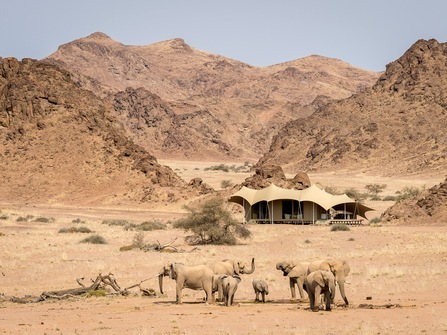 A highlight of this trip is an exclusive, ultra-luxurious stay in the Hoanib River Valley, with private access to the exquisite Skeleton Coast, one of the earth's most remote destinations. In addition to the Skeleton Coast, this trip covers the main highlight of Namibia, including the wildlife of Etosha and Okonjima, the Namib Naukluft National Park's striking desert landscape, and vibrant Swakopmund. On arrival at Windhoek Airport, you will be met and introduced to your Wilderness Air pilot for the onward light aircraft transfer to Geluk airstrip, near Sesriem. During the 1 ¼ hour flight, enjoy magnificent aerial views of the Naukluft mountains and the ancient Namib Desert. Note that luggage must be contained in soft bags and adhere to strict weight restrictions. 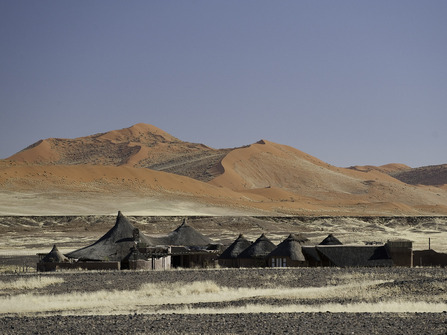 On arrival, settle into the 23-roomed Kulala Desert Lodge with it's ensuite thatched and canvas sleeping quarters, swimming pool, and delightful wrap-around veranda overlooking the stunning Namib landscape. The lodge offers nature drives and guided trips to the phenomenal Sossusvlei dunes via Kulala's private entrance. Following the day's activities, relax back at camp, with the option to sleep out under the super clear, star-studded skies on a private roof-top sleeping platform. 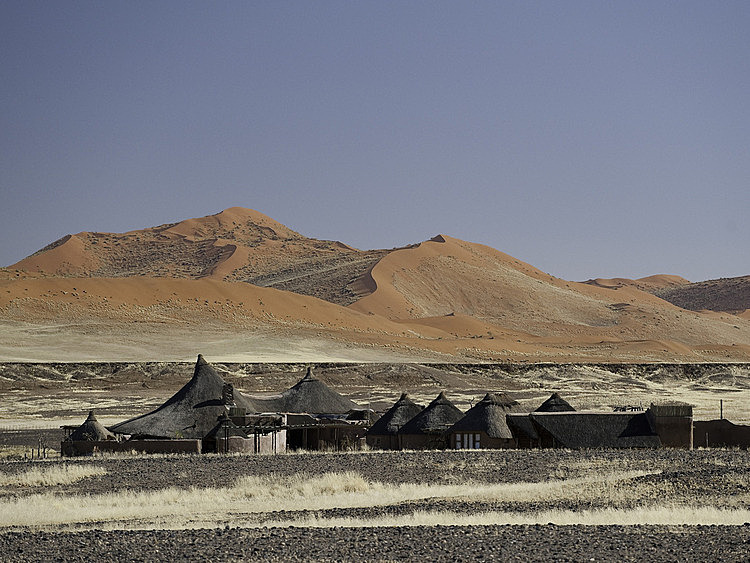 Rise early and arrive at the entrance to the Namib Naukluft National Park at dawn. This beautiful park comprises a mix of landscapes from expansive gravel plains, to orange sand dunes, inselburgs, and mountain plains. Travel 70 km through the park to reach the 'great dune sea' of Sossusvlei, gigantic dunes which cascade down to the Atlantic Ocean shore. Explore Dead Vlei, whose cracked white earth is dotted with a surreal series of 500-year old petrified trees. If time allows, the Sesriem Canyon is another enchanting destination and, at certain times of year, can be a great place for a refreshing swim. Note that the desert can be extremely hot in the middle of the day, so do remember plenty of water, a hat, high factor sunblock, and sturdy, enclosed walking shoes. 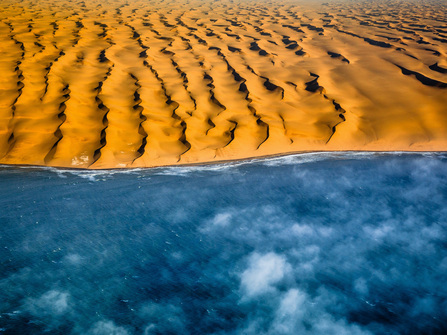 Today's hour-long light aircraft transfer from Geluk airstrip to the coastal resort of Swakopmund reveals fantastic views over the Namib Desert and the Skeleton Coast. On arrival at Swakopmund, you will be met and driven to Cornerstone Guesthouse, a small and peaceful B&B situated within easy walking distance of the beach and the town centre with its cafes, restaurants, lively pubs, and variety of interesting shops and markets. Attractions in town include the Crystal Gallery exhibition of semi-precious stones, the National Marine Aquarium, a Snake Park housing a fascinating display of Namibian and exotic species, and the Swakopmund Museum which provides insight into the town's fascinating colonial history. 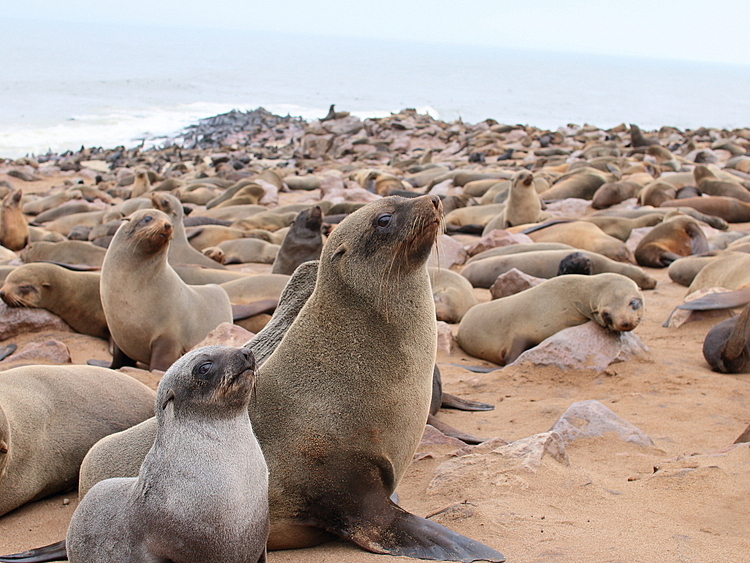 There's plenty of time to relax today and enjoy Swakopmund. Activities such as sand-boarding, tandem sky-diving, fishing, and quad biking abound. A day trip to Sandwich Harbour is one possibility, with its winning combination of towering dunes, a freshwater lagoon, and the wild Atlantic Ocean. Alternatively, half day catamaran cruises from Walvis Bay to see dolphins, seals, and an impressive number of marine birds are a delight. Other half day trips include kayaking from Pelican Point in Walvis Bay, specialist birding trips, and the Living Desert tour which reveals unique desert-adapted creepy crawlies in the nearby sand dunes. While it's possible to book some activities at the last minute, note that it's generally worth booking in advance to avoid disappointment. Today begins with a transfer from Cornerstone Guesthouse to Swakopmund Airport, and on via Doro Nawas to the the Hoanib River Valley on the border of the Skeleton Coast National Park. During the 2-2 ½ hour flight, enjoy breath-taking views over the dry, rocky interior of Damaraland before heading over flat-topped mountains and vast gravel plains to the Hoanib River. Arrive at the extremely remote yet luxurious Hoanib Skeleton Coast Camp in the Palmwag Concession, adjacent to the iconic Skeleton Coast National Park. Accessible only by light aircraft, this exclusive and environmentally-friendly camp comprises just seven comfortable, spacious, and stylish tents with superb views across the valley to a waterhole. Activities take the form of drives along the ephemeral Hoanib River Valley in search of oases supporting desert elephants, giraffe, mountain zebra, and a multitude of antelope species and predators. The Skeleton Coast has a reputation for being remote, inhospitable and steeped in eerie history. Many ships have run aground over time, and their 'skeletons' can still be seen lying forlorn and rusting along the never-ending beaches. Today, set off early in the morning for an exceptional guided drive through the Hoanib River Valley, arriving at Mowe Bay for visits to the nearby seal colony, ship-wrecks, and ancient anthropological remains. After a luxury beach picnic, enjoy a 15 minute low-level scenic flight back from Mowe Bay to camp, with unrivalled views of the untamed wilderness below. Enjoy a full day's relaxation in and around camp, enjoying the scenery and perhaps taking part in one or two optional activities as preferred. Today, enjoy superb views over Damaraland during the inland transfer flights from Hoanib, via Doro Nawas, to Ongava on the border of Etosha National Park, Namibia's premier game-viewing destination. Settle in to the Ongava Tented Camp on the 35,000 hectare Ongava Private Game Reserve. 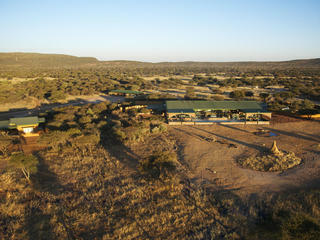 This 9-tented lodge has a sociable bush camp atmosphere. Drinks and dinner are enjoyed around the open-air fireplace overlooking a busy, floodlit waterhole directly in front of camp. Black and white rhino are common visitors to the waterhole by night, as are lions, and the occasional leopard. Activities include guided walks and night drives around the Ongava reserve, and day time game drives into the Etosha National Park. 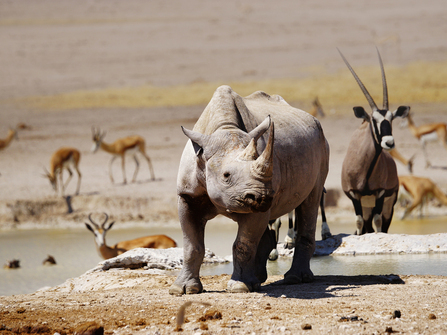 Etosha, meaning 'great white place' is dominated by a massive salt pan. This arid and chalk-white landscape is home to a rich variety of wildlife including the rare black rhino, elephant, giraffe, blue wildebeest, zebra, impala, an abundance of big cats, and an impressive array of birdlife. There's a great deal to see here, by simply resting quietly near one of the waterholes, or by driving slowly through the park and observing wildlife at the roadsides. The park opens at sunrise, and closes at sunset, by which time you will have returned to camp for dinner and a relaxing evening. Today, take an hour's flight southwards from the Ongava concession to the Okonjima Nature Reserve. 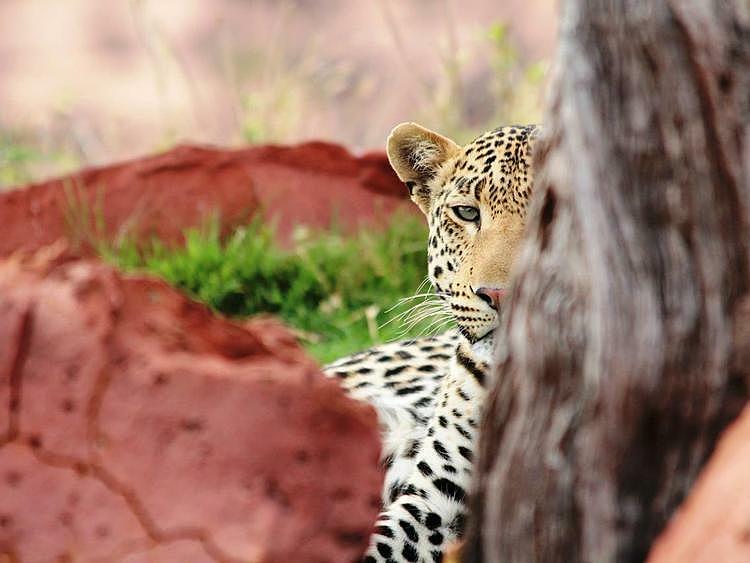 Nestled amidst the Omboroko Mountains, the reserve is home to the highly informative AfriCat Carnivore Care Centre and the 'Okonjima Experience', where visitors actively participate in a leopard sustainability programme by collecting and collating data with their professional guides. 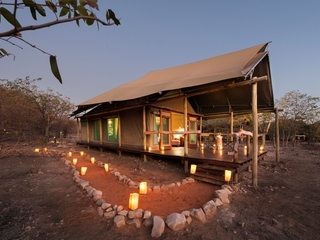 Enjoy an overnight stay at Okonjima Plains Camp, a tastefully upgraded ex-cattle farm which offers on-foot nature trails and game drives in this game-rich area. Boasting two pools and an open-plan bar and lounge, the camp is a lovely place to relax, with fabulous views of the grassy plains. Spend today at leisure in and around camp, participating in optional activities as preferred. Today's flight will take you southwards from Okonjima to Windhoek International Airport. Enjoy the views over the wildlife rich home of the AfriCat Foundation before heading to the central plateau and the International Airport in time for your onward journey. - Optional horse riding & balloon flights. Extensions to Botswana and the Victoria Falls are possible with regular connections. Flight prices on this route are always cheaper booked in advance, particularly when flying during school holiday periods. Guide price includes accommodation (fully inclusive at Kulala, Hoanib and Ongava, HB at Okonjima and BB in Swakopmund), all internal flights and airport transfers. The months from June to September are winter in Southern Africa but temperatures during the day reach very comfortable early 20 degrees Celsius, just pretty chilly at night but you can keep comfortable with various layers. This is the time of the least / no rainfall making the vegetation less dense and the game easy to spot. You could use a standard sedan vehicle for this journey but a 2x4 makes the trip more comfortable. The summer months November to March tend to be the highest rainfall which is generally when a 4x4 vehicle is suggested; it tends to be hot and humid with afternoon thunderstorms. 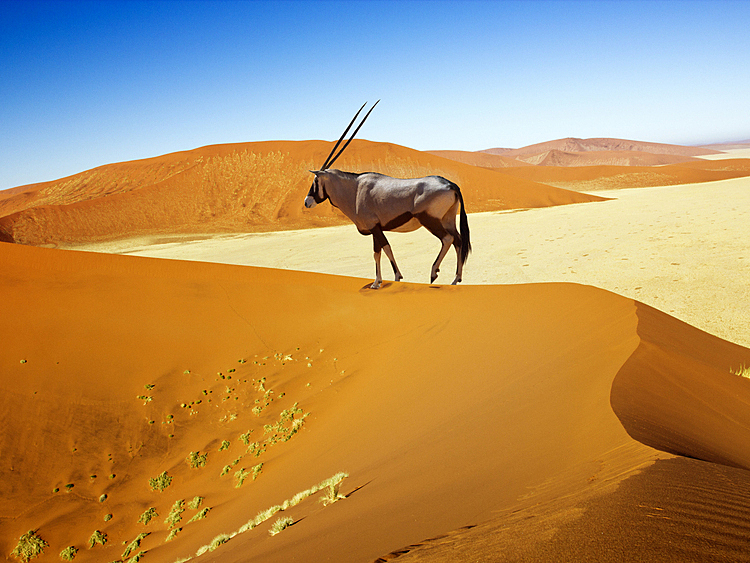 This itinerary is designed to feature the very best of Namibia including the incredible remote Skeleton Coast. As such it is suitable for those with a higher budget. 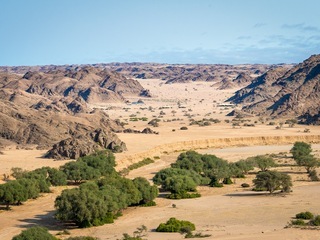 The two primary drivers of cost in this itinerary are the small plain flights between locations and the stay in the exclusive Skeleton Coast, an incredible experience that is not possible to replicate at a lower budget level.